Can also use Mandarin oranges or oranges in place of kinnow. 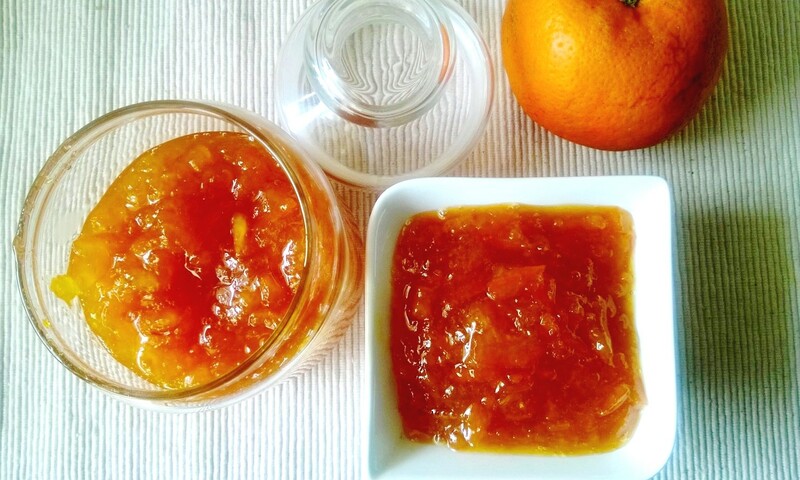 Its preferable that the skin is orange, thin and not very bitter else marmalade will be bitter. 1. Wash, dry and slice the kinnow (dont peel !!) in thin slices and then put on top of each other, chop into smaller pieces, remove all seeds. 2. Add the kinnow, sugar, lemon juice in a pan and heat it. Keep stirring so sugar doesnt stick to bottom, let it come to a boil and then reduce the heat & let it cook. 3. The mix will get watery but then will reduce. Keep stirring in between and once bit soft and water has reduced, either smash the skins a bit by hand or use a hand blender and blend it once fast, take care to do it just for few secs else the whole thing will become puree-like and will become bitter. 4. Keep cooking (abt 40-45 mins total cooking time) till its jam-like, test by putting on back of a spoon, if it doesnt run, its ready. Let it cool and fill in clean bottle/jar and store in fridge. Tastes great on top of omelletes/toast/paratha/anything.